Sophie Turner (Game of Thrones‘s Sansa Stark), who’s busy promoting the final season of Game of Thrones, was recently asked about her wedding plans with Joe Jonas and also if she would take inspiration from sis-in-law Priyanka and Nick’s wedding to have a big dance night as a ceremony. The actress responded, “The thing is: Priyanka’s family are in the entertainment industry and they can dance and sing, Joe’s family obviously can and my family is not. My brother’s a doctor, my other brother’s a lawyer,” she added. Sophie who came with her GoT co-star Maisie Williams, proceeded to imitate Priyanka’s dance moves from her wedding and after a while Maisie joined in. 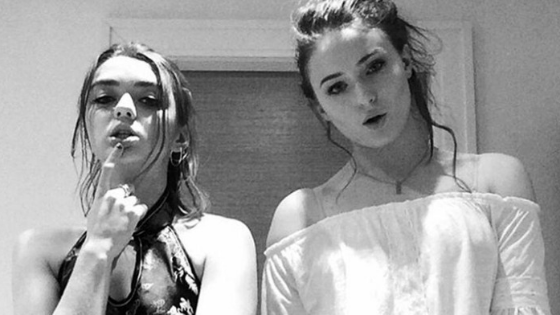 Oh yes, we saw the Stark sisters share their Bollywood moves! We saw that Priyanka and Nick’s wedding was no less than an award night in Bollywood where we saw guests give some stellar performances along with Joe and Sophie, Nick and Priyanka themselves. Do we want to see the next Jonas brother’s wedding also in Bollywood style? Hell, yeah!